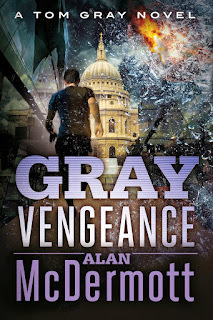 Gray Vengeance, the fifth book in Alan McDermott’s best-selling Tom Gray series, launches May 26th, 2015 to great anticipation and acclaim. The series began with Gray Justice, the story of how ex-soldier Tom Gray sets off to change the British justice system when the career criminal responsible for the death of Gray’s family gets off time served on remand. Engaging the help of his ex-SAS buddies, he kidnaps five repeat offenders and asks the public to vote on their fate: Should they be allowed to continue their criminal ways with inadequate punishment, or has Britain had enough? His website attracts a worldwide audience and, although the authorities know where he is, they are powerless to stop him. But someone else sees an opportunity to attack the UK when the authorities are focused on Gray. The series continues around the world as trouble keeps finding Gray. Gray Retribution—Gray has to rescue his new wife and daughter in the UK and his oldest friends in an African war zone—at the same time. Find more on Alan’s Author page. And get the book through Alan’s blog and website.